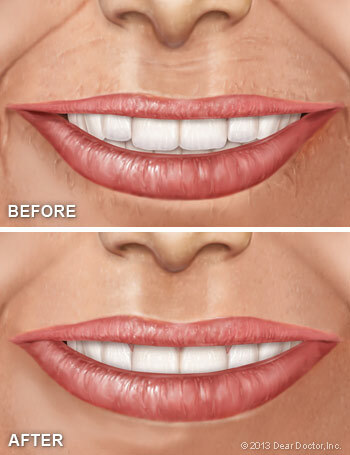 Today's cosmetic dental treatments can take years off just about anyone's appearance. Teeth whitening, cosmetic bonding and porcelain veneers are some of the techniques we can use to revitalize your smile. But don't forget that your facial features — lips in particular — provide the framework for that beautiful smile. So if you're having a smile makeover, it makes sense to rejuvenate your lips and other facial features at the same time. Some things that could detract from your smile include: wrinkles around the mouth; lips that are too thin or rise up in a way that exposes too much of your gums; and forehead creases that give you a frowning expression. Fortunately, all of these cosmetic issues can usually be treated simply and successfully with Botox and/or cosmetic fillers. Did you know that dentists are ideally qualified to offer these services to you? We have a detailed understanding of facial muscles, injection techniques, and smile design. Both procedures described below are temporary, low-risk ways to attain a more youthful appearance and enhance your smile. You've probably heard of this line-erasing treatment because it's been safely used by millions since it was approved for cosmetic use more than a decade ago. The “tox” at the end of the word signals that it's a toxin, produced by Clostridium botulinum — the same bacterium responsible for a form of food poisoning called botulism. But when injected into facial muscles, the botulinum toxin has a very different effect: It can temporarily paralyze muscles that cause the skin to wrinkle and crease (between the eyebrows, for example). It is also useful in treating certain instances of “gummy smile” — that is, a smile that displays too much pink gum tissue. A botox injection can prevent your facial muscles from lifting the upper lip and showing quite so much gum. The needles used for Botox injections are very thin, but we can numb the area topically if needed. Each injection takes a few seconds, and normal activity can be resumed immediately. You can apply makeup right away, but don't rub or press on the area for several days as the toxin could migrate to other areas of the face. If you take any prescription or over-the-counter medications, let us know: We may advise you to temporarily halt their use as some can increase bruising. Alcohol should not be consumed for 48 hours prior to treatment for the same reason. Side effects of Botox injections can include mild bruising or soreness at the injection site or headache. More serious side effects are rare. You can expect the injection to take effect in a few days to a week; the results usually last three to four months, at which point the treatment can be repeated. 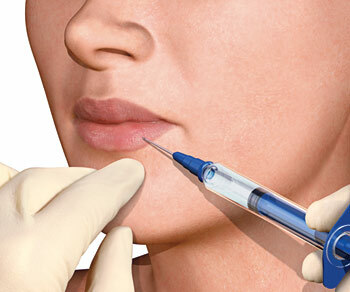 Another very effective treatment for wrinkles around the nose and mouth, which is sometimes used in conjunction with (or instead of) Botox, is cosmetic or “dermal” filler. As we age, our skin loses certain components that give it volume. One of these, hyaluronic acid, is now available as a gel that can be injected directly into creases, wrinkles — even lips — to plump them up and restore youthful fullness. The number of injections needed depends on the depth and size of the depression to be filled. Since treatment outcomes with cosmetic fillers can be affected by a variety of medications — even herbal remedies — we need to know if you are taking any prescription or over-the-counter medicines, vitamins or supplements. Before receiving the injection(s), your skin will be numbed with a topical cream or a numbing shot. As the filler is injected, some people feel a stinging or burning sensation. The total treatment time usually ranges from 15 to 30 minutes. Common side effects include redness, swelling and minor bruising, which can be relieved by icing the area right after treatment. Exercise should be avoided until the next day to prevent further swelling, and the area should not be touched for a few days. The results of hyaluronic acid fillers are immediate and typically last 6 to 12 months. Treatments can be repeated as needed. So if you'd like to attain a more youthful appearance and enhance your smile, contact us or schedule a consultation.